Edward S. Aarons released “Terror in the Town” in 1947, just two years after finishing his service in the US Coast Guard and nine years from his debut novel “Death in a Lighthouse”. While known prominently for his long-running espionage series 'Assignment', typically called 'Sam Durell', Aarons wrote nearly 30 mystery and thriller novels under the pseudonym Edward Ronns (among others) and his own. “Terror in the Town” utilizes Aarons' early experience with those genres to create a suspenseful Gothic thriller that shapes up as your typical whodunit. A sleepy seaside town in the northeastern US sets the tone and pace of the novel. I hesitate to use the term “Gothic”, but it does seem to fit with the narrative's isolation and atmosphere – windswept dark streets, shadowed manors, suicide cliffs and robust rooms cast in deep shadow. The town has it's “terror” to contend with – a strangler on the loose knocking off citizens. Young and beautiful Verity is the import, new to the town and married to the newspaper owner Jess. Early on she learns that an escaped inmate from the local asylum, Manuel, may be on the loose and the killer behind the most recent murder. As the book plods along, more murders occur and Verity begins suspecting her own husband as the killer. 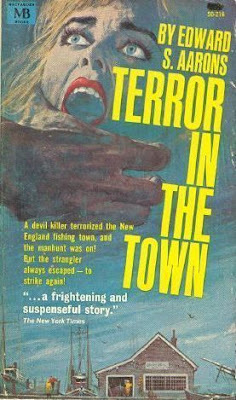 “Terror in the Town” left me lethargic in places, counting down pages until the murderer is revealed. There's a little backstory regarding a famed ship, a family secret and some lost diamonds, and that aspect might be just enough to lure in the mystery or action genre fans. For me, I was planning on enjoying an early slasher entry. It is, but just not a very exciting one. The seaside town harboring secrets with a killer on the loose is strong, but Aarons in his early development just boggles it all down to a lot of nonsense. Ultimately, the cover is far better than the book.